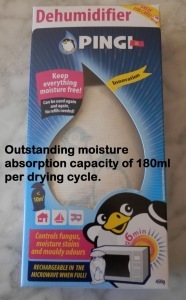 Prevent Blind Mould with PINGI Moisture Absorbers. Great to keep moisture in check. We prefer blinds to curtains in Australia. Blinds come in various shapes and sizes from Venetian to Vertical. They are easy to use, keep sunlight out and when it is cold, help keep rooms warmer. Blinds can be quite expensive. This makes blind maintenance important. One of the key things is to try and prevent blind mould. Our focus is to reduce window condensation and prevent blind mould incubation. Proper ventilation of all rooms in your house is the key. Whilst it is not possible to do this all the time, you should aim to have ventilation for at least some of a day, every day. Sounds complicated? It may be but mould cannot incubate where there is regular wind movement. External fresh air can be introduced by installing trickle vents and ensuring some form of regular window/door ventilation. There are additional issues around moisture and mould. Click on the links where we try and explain the subjects in more depth. Mould needs organic matter to feed on. Most blinds are made of man-made fibres so on its own, a blind cannot incubate mould. It is when dust and dirt accumulate on the blinds, mould incubation becomes possible. Keeping blinds as clean as possible will certainly help prevent blind mould. If you notice mould on the windows, it is important to remove the mould. Never spray any water/bleach based solution onto visible mould. You will dislodge mould spores, cause additional mould incubation and make the problem much worse. We suggest to get a damp soapy micro fibre cloth and remove all the mould and cleaning all of the window. Do not forget the areas around the window and all the nooks and crannies! Now repeat the process with a dry micro fibre cloth. Not only will you have clean windows, but you will have added another step to prevent blind mould. The last step is to install PINGI Moisture Absorbers in the area between the blind and the window. You cannot be there all the time to ensure ventilation and perfectly clean windows. Let our Moisture Absorbing Sachets help you. Free postage and handling for orders in Australia. For more information – Conservatory Blinds Ltd – has some very good information.